Living in an apartment in Seattle doesn’t offer much opportunity to grow your own small plants or herbs. The endless cloudy days and the small square footage doesn’t help the cause either. I don’t like gardening and planting but I do want to be able to eat (if possible organic) fresh salads, herbs and other vegetation without having to visit the grocery store so often. So I’ve recently become greatly interested by Aerogrow, a company that has a product line that seems to solve the dilemma for people like myself. is a dirt free, fool proof indoor plant growing device that utilizes Aeroponic technology created by NASA. Aerponic allows the plants to grow at twice the speeds compared to dirt growth. Here is a video of a comparison between growth speeds for Aerogarden and dirt. Aerogarden also allow the fully grown plants to be transferred to a pot and dirt since the roots hang down in the air and water. This product is targeted towards three demographics. The target consumer can be either one of the three or all three. At first, Aerogrow may seem to be a one product company, but the company has been able to differentiate its product into different categories and now has over 10 products in its lineup ranging from $99 to $229. Growth is where I see Aerogrow shine. Aerogrow has created a revenue strategy where the Aerogarden is like the razor/razorblade strategy for Gillette. The Aerogarden is the razor and the seed kits and accessories are the razor blades. People can’t just use any normal seeds on this machine since the seeds are contained inside a spongey material so each Aerogarden offers the potential lifetime sales of seed kits, light bulbs, accessories and additional gardens. So far Aerogarden’s are placed in four channels of distribution. Retail – Macys, William Sonoma, Sears, Target, JCPenney, Bed Bath & Beyond, Amazon, Home Shopping networks and many more. For 2008 Aerogrow is targeting other retailers such as Kohls, Sams Club, Costco, Staples and Lowe’s. The potential retail channels that could be opened is quite outstanding and Aerogrow is maximizing its first to market advantage. 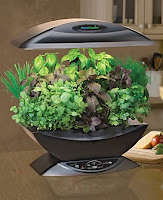 The number of stores the Aerogarden is being sold has grown from 750 in 2006 to 4,300 in 2007 to 8,600 in 2008. Aerogarden has been gaining huge traction in the market, news as well as on TV. It has been featured on The Today Show, Ellen and Tyra Banks talk shows. Aerogrow does have a competitive position, but it isn’t one that would last for years and years. It has the advantage of being the first unique consumer orientated product in the market with 11 patents pending to prevent simple direct copies, but if sales continue to occur at its current rate, there will definitely be a swarm of competitors flooding the market. This is not to say there are no similar products. In fact there is, but they are all large, ugly and sort of industrial. The Aerogarden is truly the first good looking, kitchen top and user friendly appliance. Aerogrow spent about 2.5 years in R&D before marketing the product and kept tweaking the product with tests performed by random “non techie” people with no gardening expertise until the product became fool proof. This company isn’t just trying to sell it to anyone that moves. They are focused on creating a market and establishing themselves firmly. Its array of products from a small “Prehistoric Garden” and “Flower Fairy Garden” Aerogarden to the Pro version that can grow full sized tomatoes can target all sorts of demographics but it doesn’t end with tomatoes. Aerogarden’s large number of seed kits include the following with more being researched and tested at Aerogrow. The following are the food seed kits. Salad Chef Packs – (Two-season pack, 20+ varieties of salad greens including arugula, baby greens, romaine, mesclun and butter lettuces). Consumer goods are cyclical and seasonal and there is a possibility that the Aerogarden could turn out to be a one hit wonder like numerous failed kitchen appliances. On the other hand, it could potentially become the future household staple like the blender, toaster, rice cooker etc. Being a startup with inconsistent cash generation, I have no doubt Aerogrow will be highly volatile in the short term. The company is growing at an incredibly fast speed and is using a lot of resources to invest in its business but the big risk is whether management can execute their business plan as well as having enough cash to fund operations. More information in the financial section. While listening to the conference call, I felt that management wasn’t as experienced as I hoped and it did seem like management and business processes are still being figured out and tweaked. One thing they mentioned was that a longer than expected upgrade in IT and accounting systems blanketed transparency in accounting and spending which led to a disappointing amount of money being overspent. The founder and chairman, Michael Bissonnette, is an entrepreneur with experience in creating other successful businesses. He has admitted that he has a large amount of his wealth invested so he is determined to see it become a success and it seems like he is on the right track. However, that doesn’t guarantee success. The CEO is new to the company and other members of management are all quite young. I wouldn’t call them the most experienced team such as the Coke’s, Nike’s, and Microsoft. But considering their company size, they do seem to have the necessary team and expertise with diversity in their skills. With small cap companies and especially micro cap companies, it is absolutely vital for shareholders that management is honest and ethical. I’ll continually monitor this topic. The company has been enjoying rapid revenue growth on a year over year basis and it is expected to continue. Revenue came in at $14.6 million compared to $4.9 million the prior year, but as much as the top line is impressive, the operating expenses due to media spending and expanding its distribution caused a per share loss of $0.13 versus $0.30 loss of last year. Raking in $14.6 million but still having such a large loss is clearly an area where attention must be paid. If money is burnt this fast AeroGrow could be in trouble but for now, AeroGrow can fund operations from the cash it raised in additional stock issuance. Maintaining enough cash and getting a hold on operations is something to watch out for and management is addressing this issue. Gross margins were 38.9% compared to 32.4% the prior year but came in 1% less than expected due to a free shipment promotion intended to increase holiday sales, but management is making strategic moves to increase gross margin by around 3-4%. The company has no long term debt and has enough assets to cover its short term liabilities. Its current and quick ratio is 1.58 and 1.06 respectively. Considering that a somewhat similar company, Jarden, is a 20+ year old established company and has a current and quick ratio of 1.99 and 1.11, AeroGrow’s liquidity is respectful. With the company expected to make a profit in 2009, earnings are being estimated in the $0.25 – $0.30 per share range. With the company being young and not enough information to perform a DCF, I’ll use a simple Monish Pabrai’s multiple method of using a multiple of 10x cash flow for a business with no growth but consistent cash flow and a multiple of 12-15x cash flow plus excess capital for growing companies. AeroGrow is a rapid growth company and so I will use 15x. Other stable slower companies are at the 11-13x multiples so 15x seems low and conservative considering AeroGrow’s growth. This gives an intrinsic value in the range of $4.32 to $5.07. Analysts are estimating the intrinsic value to be between $9-$10 but I think that is too lofty with too much expectation. With a current price drop to $2.50 just 2 days ago on April 30 and now trading at $2.69, it is hovering close to a 50% margin of safety. This company breaks many rules that I stick to. Specificially, it breaks the no startup, consistent cash flow, consistent growth and strong CROIC rule. However, what I find attractive is that there is a real consumer following and demand for the product. During the December holiday period, rather than sales slowing down, sales were up and in high demand which led to the 201% increase in revenue over the prior year. Also, the additional distribution growth and potential international presence is great. With countries such as UK, Japan and South Korea, where a large population live in dense urban areas and highrises, owning a garden is not realistic. People that want fresh flowers, plants, fruit or herbs but don’t want the hassle of dealing with mess and dirt and failures will definitely want something like this. The company operates in a small niche markets which will make it undesirable for the big companies to get in and its early technology advantage and patents create a short to mid term moat for the hungry copycats wanting a piece of the riches. Check out these fascinating blogs of people using their Aerogarden to grow lettuce, strawberries and herbs or even marijuana. With young companies, I find it best to follow and emphasize Philip Fishers “Scuttlebutt” approach from Common Stocks and Uncommon Profits. I’ll do a 15 point checklist on AeroGrow later on in the week. Disclosure: I own shares of AeroGrow. My question is thus: is this a company you’d invest in now? Or rather, wait until the company because profitable before investing? Also, were you cash flow numbers straight cash from operations, or a free cash flow number? There is a high degree of uncertainty about the company and so I’ve only invested a very small portion of my portfolio (3% to be precise) with the intention of investing more if profits materialise. Since it is currently only a $30+ million company, it won’t be too late for me even when the company grows some more. And I was looking at the free cash flow numbers. Thanks for dropping by. You have an interesting blog there as well. Sounds like an excellent plan. You’ve done a great job so far with Old School Value. I was re-reading your question and I don’t think I answered it completely. What I really meant was that I looked at the FCF numbers to compare performance but for the intrinsic value, since the FCF is negative, I used operating earnings to derive the numbers that I got. Hi threre I just bought the aerogrow and set it up. I got a great buy in it $37.99 at target and I bought 2 of the tomato boxes for $4.99 each. I was wondering if you are still happy with it? Have you tried to use your own seeds and if so how did that work out? PS sorry if this was off the subject but I am surfing the net for information on this kit. To be honest, I am not the owner of one yet. However, I have been searching around on growing your own seeds and there are definitely ways to do it. You can buy the deluxe kit which supplies you with a years worth of nutrients, sponges and pods separately so that you can insert your own seeds. OR you could try searching for hydroponic supplies and buy the sponges only. Off topic but the product is excellent. My wife bought me one for my office and it’s performing better than I expected it to. As far as the company goes, I wonder if AERO can break out of the niche into the larger market. From the looks of their catalog, it’s on the roadmap. There are lots of one hit wonders that fail to do that and eventually fade away. Any photos to show us progress?? I find this product really interesting just looking at the photos of other peoples experiences. As for the one hit wonder, that is very true. AeroGrow just announced they received additional financing which should help with growth. I just hope they can show some profitable numbers by end of Q3.